My account rose 0.2% for the week, while SPY lost 0.1%. The weekly chart at right makes it look like nothing happened, but the daily table below shows that the market was up and down all week. On Tuesday my account was up 1.7%, but Friday happened to the lowpoint before the next upswing. My stop-floor remains at an uncomfortable 89%, which is off the bottom of the chart. 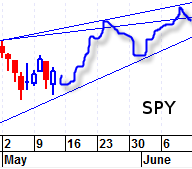 SPY: I think the change in market direction will be soon. For months it has been forecast as "early June". Tom Carreno drew the blue lines on the SPY chart at right, which dovetails with the results from my TNA predictor (see below). Tom has drawn many mutually-inconsistent charts recently so I could just be cherry-picking here. But I think I’ll sell SPY on Wednesday or Thursday. IAU: David Banister’s predictions for gold have been right on the money! Translating his $GOLD prices into IAU terms, he predicted that the price would fall to $14.26, rise to $14.82, and fall to $14.52. His next prediction is a rise to $15.87, so I have a limit order on file to sell ¼ at $15.11 if it gets there. DRETF: Released Q1 earnings, which were excellent yet again. I predict that the stock will go nowhere for several weeks, then rise to a new plateau. CYD: Earnings were terrible, so the stock gapped down. OMCL: Got whacked by a phantom bid again. My stop was below the official low of the day but triggered anyway. My sale price was the official low. I should avoid NASDAQ stocks for weekly-scan picks because bid-stops have this phantom problem and trade-stops don’t work well on that exchange. BPI: Doing very well for its first week! 16-day oscillator: ASG, HZO, and FDM are going to the slaughterhouse next week (and SBNY shortly thereafter). Hopefully these pigs will fatten up soon. 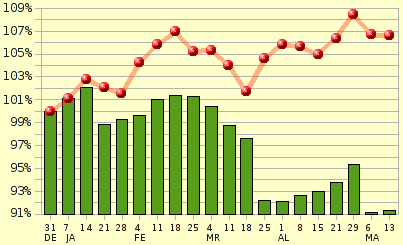 For Monday, buy nothing: the only candidate is FMO which had a nasty drop on MA05 so it is unappealing. Weekly scan: Of the five original picks from AL04, three have now stopped out. Average gain for the five is -0.9%, while SPY has gained 0.7% over the same period. 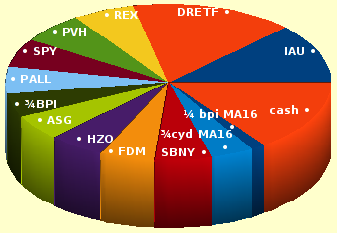 Second round: QTM did well, with realized gain of 7.1%. Third round: OMCL did badly due to phantom bid that doesn’t show on the charts. Fourth round: BPI is doing well. No buys this week beause none of the candidates are appealing. On Wednesday or Thursday I plan to sell quarters as needed to get the stops for REX, PVH, and BPI above water. Two weeks after that I’ll liquidate them, hopefully near the market top. The 16-day oscillator seems to be useful for predicting the general direction of the stock market, 8 days in advance. I am not sure why this is. It might be related to the upcoming change in market direction, which (some say) is causing many stocks to synchronize their individual ups and downs; if that is why this trick works then it will probably stop working in a few months. In the chart above, the blue bars indicate the number of hits on the 16-day oscillator (NASDAQ only, stocks below SMA-200 not excluded) while red is for hits on a 20-day oscillator. Green is price of TNA. Dark green is for when the oscillator says I should have held it. MA06 $86.22 -3.2% MA18 ??? For Monday: buy TNA, limit $86.22, stop $81.05. This is the same price as I would have paid on MA06!